Uruguay’s pioneering move to legalize the cultivation, sale, and consumption of marijuana has been met with a fair share of controversy. Both supporters and critics of the change cite public health and safety as their top concerns. In light of international drug law and the ever-present pressure to bolster global security, the Uruguay experiment begs the question – are policymakers ready to revisit global drug policy? 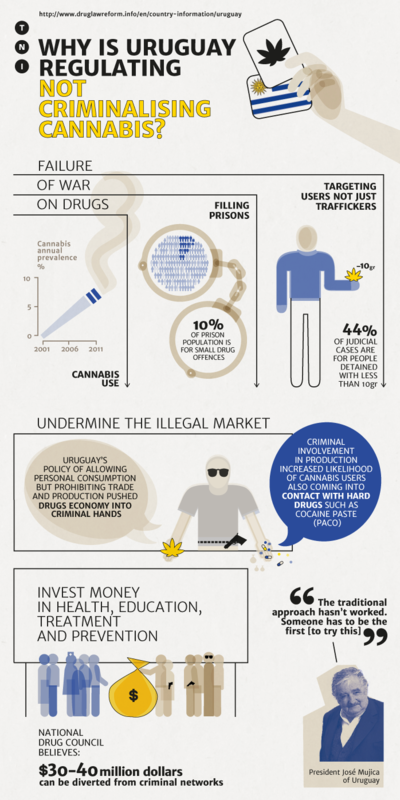 Though many celebrated Uruguay’s new drug policy, several international actors, including the United Nations Office on Drugs and Crime (UNODC) pointed out that Uruguay’s policies violate international law. The 1961 Convention on Narcotic Drugs, of which Uruguay is a signatory, maintains the criminality of the sale and consumption of cannabis for non-medical purposes. It’s new law breaks with this statute. But many experts have long questioned the effectiveness of the now 53-year-old convention in curbing drug use and trafficking. “We have tested a paradigm for 50 years, and our prisons are full of people petty users. Large drug traffickers are still in business. The reality is that enforcement of prohibition law focuses more on poor farmers and petty users than large-scale illicit business,” said Kasia Malinowska-Sempruch, director of the Open Society Global Drug Policy Program. Uruguay is not the only country to have radically changed its marijuana policies in recent times. In 2013, both Switzerland and Peru decriminalized possession of small amounts of marijuana. Ten years ago, Portugal decriminalized all drugs, including marijuana. And not so recently, the Netherlands decriminalized marijuana. Domestically, this year marks the effective beginning of Colorado and Washington’s legalization of marijuana for recreational use. “Countries must be allowed to have the flexibility to test, monitor, and evaluate policies and programs that are tailored to their realities and needs. They cannot be constrained by out-dated and demonstrably ineffective international norms, rules, and laws,” said Ilona Szabo de Carvalho, executive director of the Igarapé Institute. Since Portugal’s decriminalization of all drugs, drug abuse has decreased by 50 percent, according to experts. In a report published by the CATO Institute, Glenn Greenwald found that drug tourism did not increase, and the number of drug-related deaths decreased. In fact, the fear of getting arrested was the biggest deterrent that prevented drug abusers from seeking help, according to the study. The Netherlands, in distinguishing policies on “soft” drugs from policies on “hard” drugs in the 1970’s, now boasts the lowest “hard” drug use of any of EU country. Despite data from a variety of sources on countries, there has been little discussion on the results of alternative drug policy. Countries with reformed drug policies have reversed negative population trends: Switzerland has seen a decrease in drug-related crime, and drug abuse is declining in Portugal. At the same time, countries with hard-line policies are facing mounting problems: Russia is battling an HIV/AIDS epidemic directly related to drug abuse, and the United States faces an uphill battle in trying to reduce its large prison population (half of its federal prison population is comprised of drug-offenders). “In this atmosphere of prohibition, countries who have done something new and interesting with their drug policies are all sitting very quietly. They are not sharing the lessons learned with the international community for fear of the political consequences,” said Kasia Malinowska-Sempruch, director of the Open Society Global Drug Policy Program. How exactly Uruguay will regulate the market of marijuana is of particular interest to policymakers around the globe. Regulation policy bans advertising of marijuana, the consumption of it in public places, and penalties for driving under the influence. Sale to minors is prohibited, and citizens can grow up to six marijuana plants. Taxes on the drug will go to social services, law enforcement, and education services against drug abuse. Researchers estimate that the country could divert approximately $30 million dollars from criminal networks if the drug is regulated correctly. Critics of drug-reform fear that easing drug policy will increase the rate of drug abuse, claiming that most drug abusers first use marijuana as a gateway drug. Supporters argue that current drug laws target smaller users and not large-scale traffickers, citing prison data from various countries. In trying to figure out what is best for public health, policy makers should call for further national studies from countries who have liberalized their drug policies. The UNODC does not support Uruguay’s change in policy. “It is unfortunate that, at a time when the world is engaged in an ongoing discussion on the world drug problem, Uruguay has acted ahead of the special session of the UN General Assembly planned for 2016,” said David Dadge, spokesperson for the UNODC. Many argue that changes to national drug-policy done by and for a country may be the most effective way to combat drug-trafficking and drug abuse. “The 2016 UN General Assembly Special Session on Drugs will frankly be improved by the analysis and information generated during experiments in Uruguay, Colorado and Washington,” said Szabo de Carvalho. As other countries seek to curb drug-related violence, lessons from Uruguay and other drug-policy pioneers will prove invaluable in revealing what is and isn’t effective. Though every country undoubtedly faces specific health and safety issues, the international community must be open to considering all options available in promoting public health and safety in the drug arena. Tags: cannabis, drugs, Igarape institute, marijuana, open society foundations, Uruguay, world policy. Bookmark the permalink. the numbers should be all there is to consider. when you see a dramatic decrease in drug abuse (50%!) due to decriminalization, that should be heavily weighed when deciding public policy. great article!